Channel Islands Direct is a privately owned, independent tour operator based in Jersey. Operating holidays to the Channel Islands since 1979. A profile of Channelislandsdirect.co.uk was found on the social network Facebook. The web server with the IP-address 185.64.253.89 used by Channelislandsdirect.co.uk is run by Squiz UK Limited and is located in Great Britain. This web server runs a few other websites, mostly in the english language. 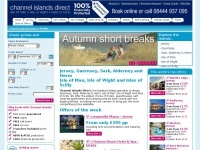 The webpages of Channelislandsdirect.co.uk were developed using the programming language PHP. The HTML pages were created with the latest standard HTML 5. The website does not specify details about the inclusion of its content in search engines. For this reason the content will be included by search engines.